In ninth pAsuram, AzhwAr says “If you want to be saved, take shelter of AzhwArthirunagari which is mercifully occupied by emperumAn whose wealth cannot be destroyed by the wrong debates of vEdha bAhya (those who reject vEdhas) and kudhrushtis (those who misinterpret vEdhas)”. Ninth pAsuram. AzhwAr says “You don’t even need to go to great heights (emperumAn) for your upliftment. It is sufficient if you focus your knowledge on thirunagari where he resides”. emperumAn, the great benefactor who is the cause of all, who is having the nature where his matters are difficult to see and determine by the collective group of six schools of philosophy which reject vEdham and are being essence just by words [no real stuff] and other kudhrushti philosophies. If you want to uplift yourself, place AzhwArthirunagari, the perfectly enjoyable abode of such emperumAn which is surrounded by attractive and invigorating water bodies, in your internal knowledge. viLambum ARu samayamum – The bAhya philosophies (which reject vEdham) which have the essence just in words since they are not based on pramANam (vEdham) and are merely sustained by dry arguments countering certain points raised by vEdhAnthis. bhAshyakArar (emperumAnAr) mercifully explained these as “SAkhya ulUkya akshapAdha kshapaNa kapila pathanjali mathAnusAriNa:” (SAkhya – baudhdha, ulUkya – chArvAka, akshapAdha – gauthama, kshapaNa – jaina, kapila – sESvara sAnkhya (sAnkhya philosophy which accepts ISvara’s existence), pathanjali matha – yOga SAsthram)). avai Agiyum maRRum – The kudhrushti philosophies which are comparable to the bAhya philosophies. “thamOnishtAhithAssmruthA:” (those who follow philosophies which reject vEdham and those who follow philosophies which misinterpret vEdham will not qualify for mOksham. They are situated in thamO (ignorance) guNam). than pAl … – In emperumAn‘s matters, even to say that “he does not exist”, one should understand his nature – but understanding his nature is impossible. That is, for bAhyas and kudhrushtis, his svarUpa (nature), rUpa (forms), guNa (qualities) and vibhava (activities) are unshakeable. Adhip pirAn – One cannot say “mEmAthAvandhyA” (my mother is barren) [bhagavAn being the cause of everything/everyone, one cannot easily reject his existence/greatness]. aLandhu … – emperumAn, the cause of the universe, who cannot be measured, lovingly resides. vaLam koL – Having wealth and being surrounded by invigorating water bodies and very attractive AzhwArthirunagari. uLam koL gyAnaththu vaimmin – uLam koL gyAnam – Internal knowledge. Before the knowledge dawns and grasps external aspects through the external senses, make thirunagari the focus of your internal knowledge. Instead of focussing the knowledge in external matters, turn it towards internal aspects [AthmA and bhagavAn who are in the heart]. ummai uyyak koNdu pOguRilE – As said in thaiththirIya upanishath “santhamEnam” (they know him to be existing), if you want to retain your existence. As said in thaiththirIya upanishath “asannEva” (he becomes non-existing), AzhwAr thinks these people who reject/misinterpret vEdham, to be non-existing. SrI rAmAyaNam sundhara kANdam 43.25 “nEyamasthi … mahAthmanA” (You manifest enmity with the great SrI rAma and for this the lankA will cease to exist. Neither you or rAvaNa will survive), as hanuman said “perumAL (SrI rAma) is only comparable to himself in his parathva form (in paramapadham) and there is no one else who is comparable to him”. 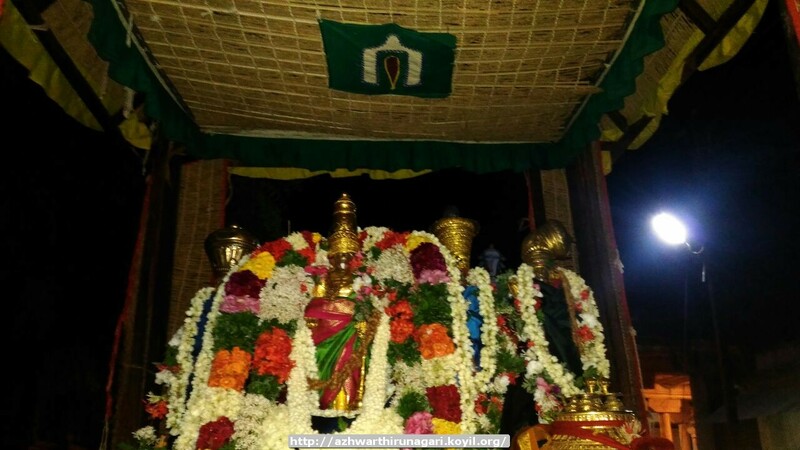 This entry was posted in thiruvAimozhi, thiruvAimozhi 4th centum on May 6, 2017 by Sarathy Thothathri.